After a bit of a hiatus / late summer break, I am back with the early October edition of #theSubRegister aimed at bringing you an interactive roundup of interesting watches for sale. The dramatic Art Deco numeral and indices are sure to catch the light and make that silver sunburst dial sing. Photo from eBay FS listing, click through for more info. The myriad of very specific complications of vintage watches never cease to amaze me. One of the more useful complications is an alarm watch - a real mechanical alarm! These were often times spun as the watch for someone very important, for timing pay phone calls, and for timing parking meters. Either way, who doesn't use an alarm function? This one in particular appears very clean and honest, and is available for a mere $345, and accepting offers. With the stark lack of detail provided, I would lean towards the low end of said offer to mitigate any risk, but the watch appears to be in good shape overall with a clean dial with all lume plots present. The sharp, angular hands and indices bring some classy interest to the silver sunburst dial, that I imagine the camera is doing no favors to. Make an offer on eBay here. Everything looks completely original, correct, and very attractive on this watch. Photo from FS listing, click through for more info. I think the hardest part of putting together these posts is not buying half of the watches. This is one of those times where I'm thinking to myself, this is a hell of a watch at a decent price! The Wittnauer ref. 4000 skin diver was introduced in the mid to late 60's utilizing the classic skin diver case shape with it's somewhat rectangular overall shape and squared off, wide-planed lugs at 38 mm in diameter. I think the seller is being somewhat modest in his description of the watch with what appears to be a very sharp case, and the original crystal with the internal trapezoidal magnifying date window. I believe the large unsigned crown for this reference is correct, with the later automatic versions of this watch receiving a signed crown. The lume on the dial and of the times ladder hands (and paddle hand sweep seconds) appears to be thick and even, aging to a nice patina. Throwing in NATO Strap and a Tropic strap, as it was likely supplied on, is just icing on the cake. Hodinkee sold the same watch, with darker and less even lume at $1900 here. This watch is available on WatchUseek forums for a $995 asking price. Gotta like the big diver's lume plots and signed oyster bracelet on this one. Photo from FS listing, click through for more info. This next one is a good example of the accessible finds that can be had on any given day. It sold in just a few hours, but when keeping an eye out there are some cool options available. 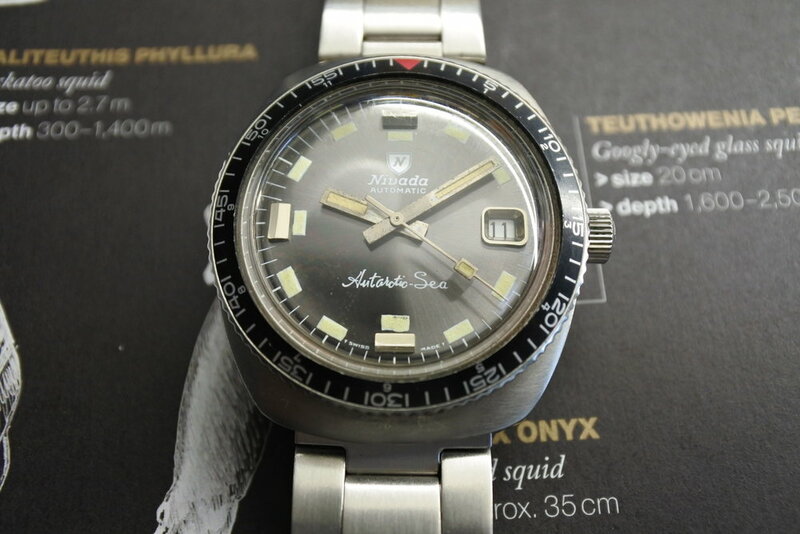 This Nivada could also be put under the cheap thrills category with this hunk of 70's steel oozing character from the dark gray sunburst dial, the funky chunky metal indices at 6, 9, and 12, and the paddle seconds hand. Throw in the said to be original and signed Nivada Oyster bracelet and you've got yourself a cool vintage dive watch for a mere 350 Swiss Francs or about $360 dollars from a reputable seller over at ChronoTrader. This one is already sold, but I did want to include what can be found. Very clean layout, great fonts, and a lot of understated detail. Photo from FS post, click through for more info. The adage in vintage watch collecting is always "condition, condition, condition." But at the same time, I do like to show that you don't have to have a big bank roll to still get some really great watches that don't need to be safe queens. The case on this one is a bit soft, but the watch has a great vintage aesthetic that really makes it stand out from anything out there today with the sub seconds, applied logo, and angular indices complementing the warm patina of the dial. The seller does indicate the bracelet is probably not on its original end links, but the Omega Beads of Rice bracelet really tops off the vintage package in a very daily wearable piece otherwise, and it would look great on a leather strap. 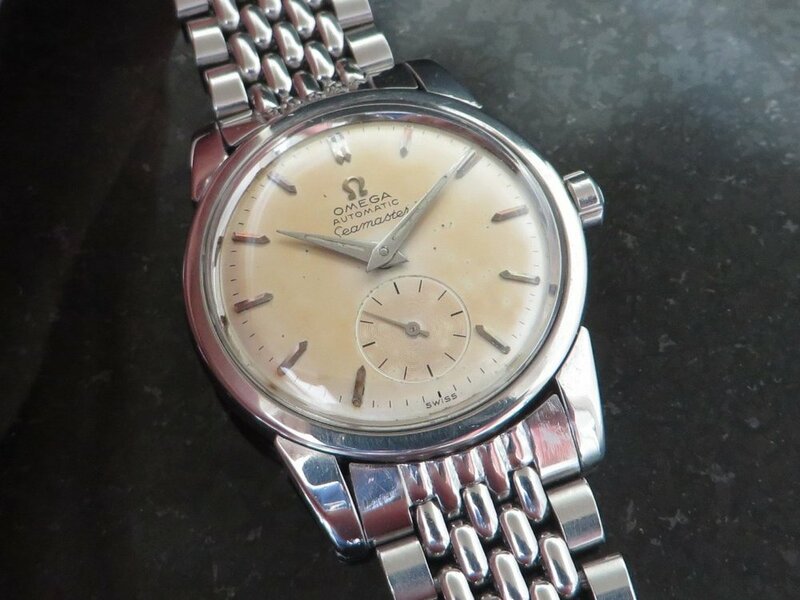 The long lugs will make the 34mm diameter wear larger than it would indicate and the original crown and great dial pack a lot of punch for the $625 asking price over on OmegaForums. As always, if you have any questions, comments, or finds out and about, feel free to comment below, tag me on instagram or Twitter, @meticulist or send me an email at meticulist.net(at)gmail.com.